This mild weather has been perfect for getting out and doing some yard work; if you’ve been doing the same you may have noticed bur clover popping up around your lawn. 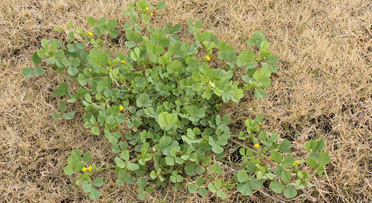 Bur clover (Medicago polymorpha L.) is a common annual weed that can act like a perennial in our local climate. While it’s pretty cute and delicate looking, it’s those mean seed burs that you have to worry about. It has three leaflets with toothed margins, inconspicuous yellow flowers and a prostate growth habit. It’s not a true clover but is in the Fabaceae family, meaning that its roots fix nitrogen into the soil helping to improve nutrient content. If you think your lawn could use a boost, feel free to let it grow. The downside is that once it goes to seed you will have those spikey, hooked seed burs sticking to your socks and clothes. As with most things, prevention is the best method of control when it comes to weeds in the lawn. Healthy, dense, turf will do a great job of inhibiting seed germination and preventing bur clover from becoming established. It’s always a good idea to start with a soil test to determine existing nutrient content to ensure that you are applying only what is needed to your lawn. However, most homeowners are not thinking about problems that may or may not happen in the lawn. Weeds are usually well established by the time we realize action is needed. Manual removal is always an option, be careful to dig around the plant and remove the root; otherwise breaking the stems can actually cause the plant to come back and spread more. In your flower beds a 4-inch layer of mulch can block sunlight and suppress germination. For well-established patches of bur clover you may need to try chemical control. Pre-emergent herbicides will prevent any existing seeds from germinating, but as the name suggests you have to do this before you see the plants. Ideally this would be applied in the fall around October or November before the seeds have sprouted. Be cautious of applying weed and feed type fertilizer around or near the drip line of trees and shrubs as they can stress those types of plants. Once you see the bur clover plants, you will need to use a post-emergent herbicide (2- or 4-D with dicamba is commonly used) that can help to control the actively growing plants. You may need multiple applications for complete control. For herbicides to be most effective, they should be applied when temperatures range between 60 to 80 degrees Fahrenheit, wind is below 10 mph (to reduce drift) and no rain is in the forecast for at least 24 to 48 hours.